Fall has arrived. The temperature is dropping, summer green leaves are turning a multitude of brilliant fall colors and yes, the days are getting shorter and the nighttime longer. This is the time we outdoor lighting designers love the most. You and I get to enjoy the scenes we create longer, as we transition to fall and then into winter. We know through experience and our clients’ reactions that fall can be the most dramatic and interesting time of year to witness Mother Nature’s change through light and shadow. One might argue that they don’t go outside into their gardens at nighttime during the fall and winter months. That’s when we offer to bring those beautiful scenes into your home. 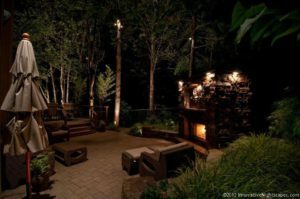 Through trial and error and many hours of testing in different scenarios, we have developed techniques and products to transform your home’s windows and glass doors into nighttime portraits of your favorite outdoor scenes, trees, sculptures or whatever you love the most. You’ll no longer feel closed in a fish bowl, looking at reflections of the inside. Your indoor spaces will open back out to your gardens creating a wonderful feeling of openness and depth. We would be thrilled to demonstrate these techniques for you to witness before you commit, so please give me a call for more details.